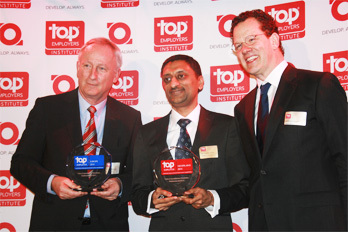 Amsterdam, March 13, 2014: Tata Consultancy Services (BSE: 532540, NSE: TCS), a leading IT services, consulting and business solutions firm was certified by the Top Employer Institute as the number 1 Top Employer for 2014 in the Netherlands. The company was also certified and ranked as number 1 Top Employer ICT of the year. The Top Employers Institute (formerly known as the CRF Institute) researches employers around the world and, identifies and certifies excellence in the conditions that employers create for their staff. TCS was recognized for its exceptional and outstanding performance across human resources practices: primary benefits, secondary benefits, working conditions, training and development, career development and culture management. David Plink, CEO of the Top Employers Institute said, "Tata Consultancy Services stands out in providing optimal employee conditions that ensure that people can develop themselves personally and professionally. Our comprehensive research concluded that Tata Consultancy Services in the Netherlands provides an outstanding employment environment and offers a wide range of creative initiatives, from secondary benefits and working conditions, to performance-management programmes that are well thought out and truly aligned with the culture of their company." Amit Kapur, Regional Director, TCS Benelux said, "We are delighted to be ranked as the number 1 Top Employer as well as Top Employer ICT in the Netherlands. The fact that we are also certified for the fourth year as Top Employer ICT, demonstrates our continuous endeavour to invest in our employees who are the most valuable asset. We always aim to provide them with a great work environment in which they can excel. Additionally we push the envelope to match the global benchmarks in the areas of Human Resources." TCS was also ranked number 1 Top Employer Europe for a second consecutive year. With this recognition the company is certified in 7 European countries (Belgium, Denmark, Germany, Netherlands, Sweden, Switzerland and United Kingdom). The award underlines the high quality of TCS’ human resource practices, focusing on personal growth and development of its employees worldwide. Tata Consultancy Services is situated in the Netherlands since 1992 and has over 2,500 employees working for Dutch clients like Royal HaskoningDHV, ABN AMRO, ING Group, KLM and NXP Semi-conductors. TCS is ranked as one of the ‘big 4 brands’ on the Brand Finance ranking list of most valuable brands in the global IT-industry. The Top Employers Institute globally certifies excellence in the conditions that employers create for their people. Optimal employee conditions ensure that people develop themselves personally and professionally. This in turn enables companies to grow and to develop, always. Headquartered in the Netherlands, the company, previously known as the CRF Institute, has recognized Top Employers around the world since 1991. Recognition as a Top Employer enables companies to stand out as employers of choice. This is beneficial for all stakeholders, and in particular their current and prospective employees. Being certified provides companies with the opportunity to celebrate their achievements and to reinforce the role of the HR environment in the business.